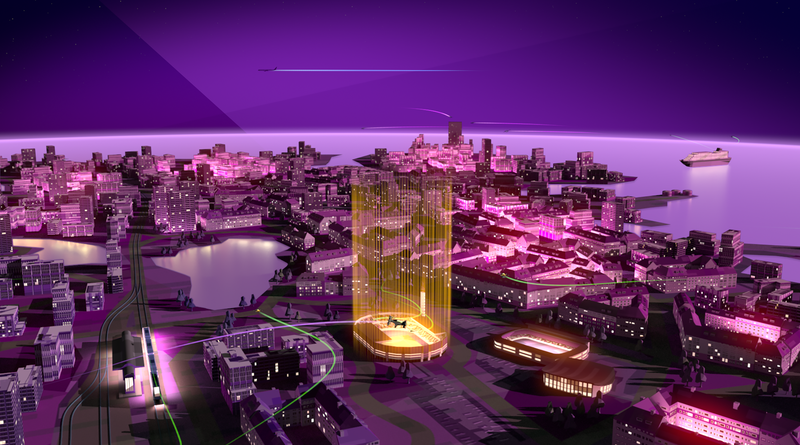 The future of our urban air mobility means better management and coordination of air traffic. The Airbus Altiscope Blueprint takes a deep dive into how eVTOL aircraft, electric helicopters, electric airplanes, and new personal air mobility platforms will share our airspace. More than 3.5 billion passengers traveled by air in 2017. The World Bank expects a 10-fold increase in 30 years. The IATA estimates air passengers will nearly double by 2036. Obviously, air traffic needs to handle this increase. The electric vertical take-off & landing (eVTOL) industry is taking off faster than expected. Our friends at eVTOL.news list 56 electric air mobility platforms, 30 hover bikes and personal aerial devices, 17 lift & cruise platforms, 34 wingless multicopters, and 4 electric helicopters. Who knows what else is in development? As battery energy density shrinks and prices go down, electric aviation gets more and more competitive. It also allows more creativity. New urban air mobility concepts are introducing new shapes and designs, pushing the boundaries of what we thought was possible. Electric powertrains are changing the way we drive, the way move on water, and the way we fly — or getting close. But now there is a serious need to look into the coordination of these new urban air mobility platforms. In other words, how can personal mobility be coordinated with emergency needs? And what about private/personal mobility? The Airbus Altiscope project takes a deep look at these questions. According to the Airbus Altiscope Blueprint, NASA’s Unmanned Traffic Management (NASA UTM), Europe’s SESAR Joint Undertaking, and Japan UTM already have a framework to safely manage the growing use of low-altitude airspace for eVTOL aircraft. All will work globally relying on networked, microservice-oriented system architecture. The Airbus Altiscope Blueprint wants to transform airspace faster so that the next generation of unknown aircraft can coexist. The Airbus Altiscope is an adaptive blueprint for the skies that is flexible enough for future unknown air mobility designs. Part of the Altiscop Blueprint is the Unmanned Traffic Management (UTM), a complex de-centralized framework of networked services working together based on common sets of rules. It functions much like the internet, designed to be highly redundant and agnostic. Instead of the current centralized control platform, UTM uses a distributed authority that can meet tomorrow’s unknown demands via flexibility. It can quickly adapt as the market evolves. Specifically, this means that instead of talking to a single air traffic controller, tomorrow’s aircraft will communicate with its service suppliers of choice, each held to a shared set of safety, security, and performance standards by the authorities. Traffic will be coordinated based on specific flight objectives. Human air traffic controllers will become airspace managers, focused on oversight, safety, and security. This will reduce the stress on their decision making and ease their chronic under-staffing. 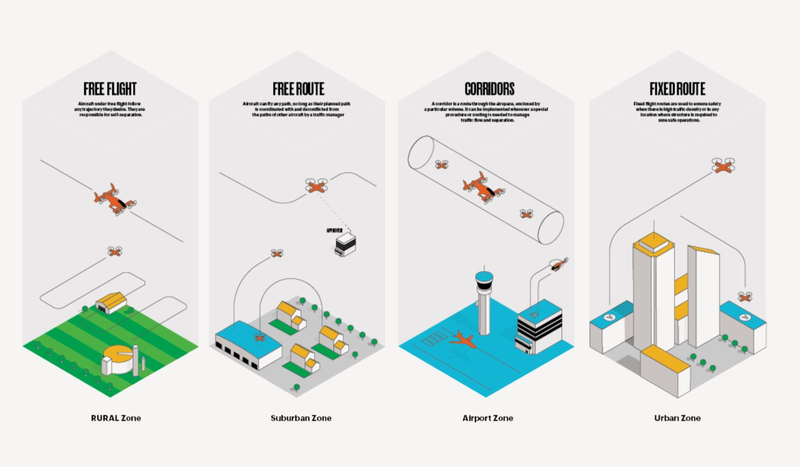 The Airbus Altiscope Blueprint is divided into two streams: 1) controlled airspace and 2) the UTM services network. Controlled airspace improves the existing airspace coordination for the future, while the UTM services network develops services sets. Drones occupy the 0 to 400 feet airspace for inspections, image capture, construction, agriculture, disaster relief, insurance, and more. From 0 to 1,000 feet, the airspace will be used for home and urgent medical deliveries, including from small drones and larger eVTOL aircraft. 1,000 to 3,000 feet is the space for helicopters geared towards endurance and capacity for emergencies, as well as search and rescue. 500 to 5,000 feet will be used for private and non-commercial flight, such as high-performance business jets, medical transportation, gliders, and flight trainers where pilots can fly without filing a flight plan. The 1,000 to 12,000 feet airspace is for national and regional governments — especially law enforcement and emergency management with light aircraft, helicopters, and drones. It’s also for military training with various aircraft and drones. Priority access to that airspace is necessary, with restrictions to define training routes essential to public safety as well as national security missions. 1,000 to 10,000 feet will be for complicated unmanned operations with single pilot operations and remotely piloted cargo aircraft. An estimated 25,000 commercial flights in the air during peak times means greater automation. 10,000 to 40,000 feet is for high-altitude self-piloted and remotely piloted drones flying for long periods. Those services including sub-satellite imaging and provision of internet access. Anything above will be used for High Altitude Pseudo-Satellite (HAPS) and other high-altitude aircraft. Will It Be Safer To Fly Tomorrow? And you thought you had a complicated job!